Our industry leading sash horn windows provide the traditional aesthetics of yesteryear combined with 21st century materials which offer superior performance and functionality. Our sash horn windows preserve the classic look of wooden box-sash windows, maintaining the authenticity of any property. This is achieved using a fully integrated run through sash horn which is a continuation of the sash frame for outstanding authenticity and far superior to the screw on types a lot of other companies use. We also use a mechanically jointed bottom rail on the opening sash instead of a welded finish to complete the look. This is done using a very precise CNC machine allowing for tighter tolerances and an overall better quality finish. Manufactured using Liniar’s EnergyPlus six-chambered profile they offer the unrivalled thermal performance and slim sightlines as our standard casement windows. Measuring 70mm front to back they are also suitable to nearly any property and eliminate the need for cutting back plastered reveals where conventional casement windows are removed. 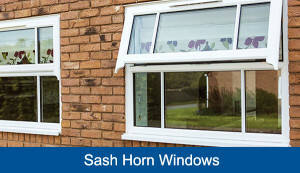 They also offer a lower cost alternative to traditional sliding sash or timber windows. Designed to achieve the highest levels of weather-tightness and resistance to draught using Liniar’s exclusive double-action bubble gasket, used in all its glazed products, keeps your windows leak-free and weather proof by delivering a continuous seal – even in the corners. For peace of mind they are internally glazed and use Yale’s Shootbolt high security locking system as standard which is back by their Security Guarantee which offers up to £1000 towards to insurance excess in the unlikely event of a break in. We can also offer other upgrades as with our standard casement windows including stay guards.